The Montessori-Centre of the University of Muenster works in close collaboration with the German Montessori Vereinigung (Association). 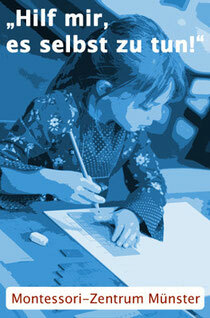 The Montessori Vereinigung unites a great number of theorist and practitioners of the Montessori pedagogy in Germany. The Montessori Vereinigung and the Deutsche Montessori Gesellschaft (German Montessori Society) form the most important Montessori organisations in Germany. The Montessori-Dachverband Deutschland e.V. (umbrella organisation) combines all important Montessori organisations in Germany. The Montessori Vereinigung publishes a journal called "Montessori". Montessori experts of the University of Münster work in the editorial board and Prof. Dr. Ludwig is the responsible editor. Furthermore, the Montessori Vereinigung arranges courses for the acquisition of a national Montessori Diploma, which is accepted by the Association Montessori Internationale (AMI) in Amsterdam as a national diploma. Within the program of further education diploma courses like this are also arranged by the Montessori-Centre Münster in cooperation with the German Montessori Vereinigung. The last diploma course will end in February 2016. The last certificate course (Montessori pedagogy in secondary schools) ended in February 2015. A new diploma course will start in spring 2016. The beginning of a certificate courses is not planned in detail yet. If you are interested in additional qualifications we can put your name on our list of prospects. You will be informed about the beginning of the registration in good time. Just write an e-mail to eingang@montessorizentrum-muenster.de.